We are seeking to hire an experienced heavy equipment and diesel mechanic. Must have experience working on diesel machinery. Apply online, fax resume to 904-296-6574 or apply in person at 7544 Philips Highway Jacksonville, FL 32256. No phone calls please. EOE. We are seeking qualified drivers. MUST have CDL Class A license. We are seeking individuals with experience in operating an asphalt plant. MUST have Plant Operating experience. Thank you for your interest in a career with Duval Asphalt. 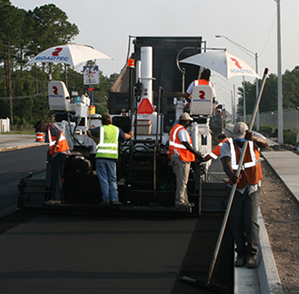 Duval Asphalt has established itself as the Jacksonville-area leader in quality workmanship and innovative technology pertaining to all aspects of the asphalt paving industry. Our role as a leader in this field has been achieved through years of quality service to our customers built on a philosophy of uncompromising superior workmanship and longstanding relationships with our clients. Our employees recognize our commitment to quality work and customer service and play a very vital role in keeping this tradition alive. They achieve a great deal of pride and personal satisfaction knowing they have helped create our legacy of exceptional achievement. Duval Asphalt will never compromise quality for price nor will we leave a project in an unacceptable condition. As an employee of Duval Asphalt, you will choose to join one of the most highly regarded companies performing asphalt paving and paving related services in the country. Please consider our Management Philosophy carefully before applying for a position within our company. Our image is very important to us and we regard our reputation as one of the hallmarks of our organization. This is evident in our commitment to maintaining quality job site conditions, and using and maintaining the best equipment possible. Our employees ensure that our clients and the general public positively perceive us. Duval Asphalt is an Equal Opportunity Employer. Duval Asphalt employees and their welfare are very important to the success of our company. Our long-range objective is the continuous development of a growing and prospering business through which both the employees and the company will benefit. Every employee is considered a member of our company team. Our success as a company is built on the recognition of the skills and efforts made by each employee. It is our policy to work with all members of our team in a fair and friendly manner and to treat each team member with dignity and respect. The management of Duval Asphalt will work continually for the benefit of our present and prospective customers as well as our employees to improve the competitive position of our company. This will enable us to provide excellent jobs for our team members. We will devote our best effort to conducting an expanding business facilitating an atmosphere of harmony with opportunity for all employees of Duval Asphalt.